Is the Tier One team still number one in your book, during the second season of the SEAL Team TV show on CBS? As we all know, the Nielsen ratings typically play a big role in determining whether a TV show like SEAL Team is cancelled or renewed for season three. Unfortunately, most of us do not live in Nielsen households. Because many viewers feel frustrated that their viewing habits and opinions aren’t considered, we’d like to offer you the chance to rate all of the SEAL Team season two episodes for us here. What do you think? Which season two episodes of the SEAL Team TV series do you rate as wonderful, terrible, or somewhere between? 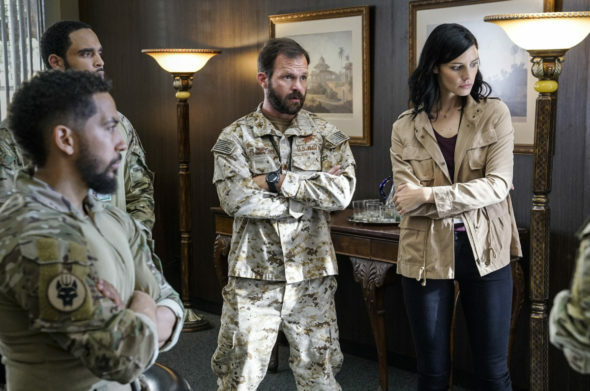 Should CBS cancel or renew SEAL Team for a third season? Don’t forget to vote, and share your thoughts, below. More about: SEAL Team, SEAL Team: canceled or renewed? Please leave Seal Team on!! My husband and I LOVE it. It’s probably the one show I most look forward to each week. I will be CRUSHED if Ray cheats on his wife. It’s breaking my heart seeing him question his faith, but I love how realistic it is. Renewed the Seal Team is very realistic and gives you an idea on how our soldiers and their families sacrifice for our freedom. Support our troops!!!! Seal Team should be renewed!! Maybe CBS should look for a better time slot for the show. Please leave Seal Team on! Me and my husband love watching it! Quit taking all the good shows off!